Note: Oregon Now Has Placed a Moratorium on Motorized Prospecting! 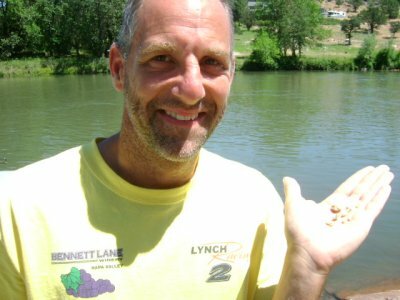 Well, here’s my total gold from dredging in Oregon — what a blast I had! My total was 9.5 ounces of beautiful gold! Well it was prospecting, prospecting and then more prospecting to find some rich pockets. I moved around a lot. I moved around so much that after June, I did not even tie my dredge to shore while dredging. I just dragged it wherever I felt like going with my nozzle while under water — even out into the gut of the Rogue River without a line to shore. I was “free” to prospect wherever! I tied my dredge off to shore over night. Basically, if you want a “how to” answer, I learned most of how I prospect from The New 49er’s Club. So if I have to give credit it will be to Craig Colt who taught me a whole lot while working with him on his 8″ dredge a few years back. And of course the remainder I learned from Dave McCracken either directly or indirectly and other 49’er members. The 49’ers are so valuable at learning gold mining, it would be hard to be without the membership and the members. So out of the 90 days that were available in the season, I dredged about 70 of them. It would have been more if it were not for a death in the family (flew back to Atlanta), and I also lost some days when they removed the Gold Ray Dam. 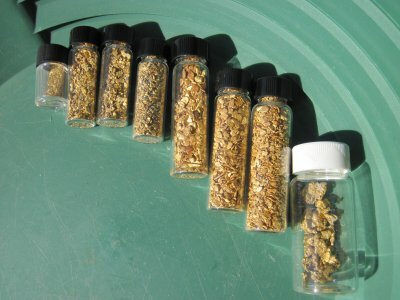 Its really all about finding high-grade gold and mining it and then moving on to find more when it is exhausted. It was a wild Summer in Oregon for sure! Got to heal up for next Summer. I hope to see you guys out there!